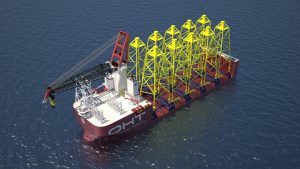 Liebherr-MCCtec has been awarded the contract by the Oslo-based company Offshore Heavy Transport (OHT) and China Merchants Heavy Industry (CMHI) to deliver a heavy lift crane for a new generation semi-submersible offshore windfarm foundation installation vessel. On 6 July, CMHI and Liebherr signed the contract in China. Liebherr together with the Norwegian companies OHT, Ulstein Design & Solution, DNV GL as well as Chinese shipyard CMHI are working to manufacture a unique vessel for applications in the wind energy sector, decommissioning, the installation of offshore platforms and for heavy-duty transports. CMHI, a well known manufacturer of offshore equipment and large vessels, is going to build the 216.3m long ship at its dockyard in Haimen on behalf of the heavy transport vessel operator, OHT. Ship designing company Ulstein created the patented Alfa Lift concept in close cooperation with OHT. “Since 2016 we have been working very closely with OHT targeting an efficient design to meet the project requirements and thereby decreasing the costs of installing windfarms on high seas. We have now succeeded in doing this and also achieved an optimal balance between weight and performance”, says Armin Seidel, Area Sales Manager for Offshore Cranes. “CMHI is a very competent partner and we look forward to future cooperation on the project”, Mr Seidel concludes. OHT’s new semi-submersible vessel also provides an ultramodern installation concept, which will influence and change the offshore market. Liebherr supports this with a HLC, the company’s latest crane series in the heavy lift sector. The HLC 150000 is able to lift up to 3,000t. Based on the company’s well-proven crane design with slewing bearing, A-frame and lattice boom, the crane provides the highest reliability and flexibility. Its robust design withstands dynamic conditions and motions. The 48,000dwt installation vessel is able to submerge when in operation which increases the stability of the crane. As a result the HLC resists a wider variety of environmental scenarios and thus makes it possible to operate in almost any weather. With the combination of a large safe working load and a lattice boom more than 70m long, the crane will be ideal for the transport and installation of windfarm foundations on high seas. This is supplemented by the space saving positioning on top of the ship’s bridge. The crane features a foldable A-frame which makes passage under bridges possible. Due to this newly developed and intelligent concept, the vessel saves time and thereby also increases the operating times. Additionally the crane is equipped with several tugger winches and trolley hoist for optimal positioning of the load. Because of the availability to operate in split hook mode, the crane can carry 1,500 tonnes on each hook at the same time. The crane will be produced and tested at the company’s production site in the port of Rostock/ Germany.